In the Old Testament, God tells Noah he has to build an ark and load a pair of every kind of animal before a great flood engulfs the world. The story is widely regarded as a myth, but could it actually be true? The story of Noah and his ark is one which sticks in the minds of children and never gets forgotten. God warned Noah - the only good man left in a world full of corruption and violence - to prepare for a great flood. With his sons he built a great ark and the animals marched in two by two. By the time the rain started to fall, Noah was ready. 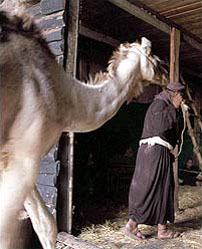 The ark was a refuge until the waters went down, leaving Noah and his menagerie high and dry on Mount Ararat. There are many problems with the story. If it is taken literally, it would have taken a total of thirty-five years for Noah and his family to load two of every animal on the planet. In addition, a flood that engulfed the world would have left a signature for geologists to spot - and yet none has been found. But it is possible to build a much more credible version of the story based on a different reading of the Old Testament, by using ancient Babylonian sources which predate the Book of Genesis, and on archaeology and science. The traditional shape of Noah's Ark comes from the imaginations of nineteenth century artists. It would have been about 137 metres long (450 feet), and experts say it would have broken apart. What's more, even if such a feat of marine engineering had been possible, there are about thirty million species of animals in the world. For so many creatures, an entire fleet of enormous arks would have been needed. Geologists have also proved that there is not enough water in the world to cover all the continents, then or now. But just because the details of this familiar story do not add up, should we turn our backs on Noah and the ark? Instead, we have to forget the idea that such a huge boat carrying all known animals existed, that it came to rest on Mount Ararat in modern-day Turkey, and that a flood covered the entire planet. What we know of the culture of what is now Iraq provides the first glimpse of the real-life historical figure behind the myth. Noah may have been king of a city called Shuruppak. He would have had a kilt, a shaven head, and eye make-up, like the figures portrayed in artworks created in what was then known as Sumer. The epic of Gilgamesh says this Sumerian Noah had silver and gold, then the currency of wealthy merchants, suggesting that he was a businessman. Could this story have provided the inspiration for the holy men who wrote the Book of Genesis around the middle of the first millennium BC, while the Israelites were captives in Babylonia? Instead of building an ark to survive a great flood, he is more likely to have built boats to trade goods such as beer, grain, and animals. All of the big trading centres of the era were on the River Euphrates, and it was cheaper to move goods by water than on land. Sumerians were able to build barges about six metres in length (twenty feet), and marine archaeologists have not found remains or inscriptions of larger vessels. But they believe that the technology existed to have built a series of barges and use them like pontoons on which a much larger boat, or ark, could have been constructed. Parts of the Euphrates were only navigable at certain times of the year, when the waters were deep enough for large boats. Noah was likely to have waited for the melt waters to arrive in June and July and, if these had combined with a tropical storm, the river could have flooded the Mesopotamian plain. 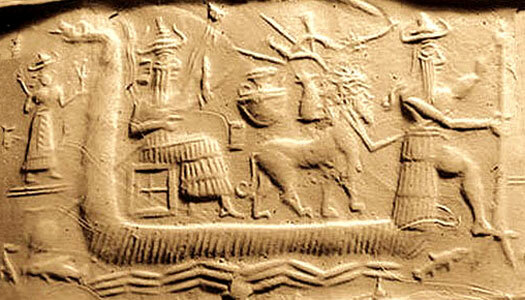 The Sumerian myth of Ziusudra exists in a single copy, the fragmentary Eridu Genesis. It tells how the god Enki warns Ziusudra, king (or prince, or noble) of Shuruppak, that the gods will destroy mankind with a flood. See Kings After the Flood for full details. More specific dating for this Sumerian flood event, which was probably on a par with the two twenty-first century floods of Somerset in England, place it between 2900-2750 BC, based on deposits found in several Sumerian city sites. The currents in the area would not have taken him towards Mount Ararat, but out into the Persian Gulf. Life would have been difficult, but he and his family could have survived on the animals and beer on board. One Babylonian text suggests that the ark came to rest on what is now the island of Bahrain, providing a very different yet plausible end to the adventure. The writers of the Book of Genesis may already have known something of the story through their Mesopotamian ancestry - the early Israelites migrated from the city of Ur under the leadership of the father of Abraham - but being back in Babylon as part of the Israelite captivity they would certainly have received a refresher course. When they did, how could they fail to recognise its moral power, that if humankind falls short of God's laws, there's a dreadful price to pay. Behind that moral message lies one of the world's greatest stories. And behind that story can be glimpsed a real man, a real boat, and a real adventure.